Organic Apple Juice, Plantain and firming Pectin combine in this clarifying treatment for sun-damaged, lined or clogged skin. Apple Refining Mask helps eliminate toxins and impurities while minimizing the appearance of pores and dark spots. Apple Refining Mask contains Fruit Acids, Borage and Green Tea to improve skin texture, lines and discoloration while triggering new cell production. 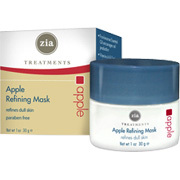 Apple Refining Mask - 1 oz., (Zia Natural) is shipped in a discrete, unmarked package. Orders are processed immediately and usually takes about 3 to 5 working days to be received. We do ask that you try it for 2 to 3 weeks to feel the full effects. Any information received is used only for order processing and shipping purposes. Your information, such as e-mail address, will never be disclosed to a third party.